2012 Unicyle Season Happening Now. 13th Annual LBI Unithon Coming up. A few 2013 upcoming unicycle events are upon us. In addition to our local happenings like our twice per month unicycle club meetings, there are major events that are scheduled to occur. Check out the events highlighted on our Calendar page and make your plans to attend. I wish you all a healthy and fun unicycle season. First up is the North American Unicycle Convention and Championships (NAUCC). NAUCC for this year is scheduled for July 21-27 2013 in Butler County, Pensylvania. This year’s event is being hosted by The Butler Wobble in conjunction with the Unicycle Society of America (USA). Riders will be competing in a number of events including races, freestyle competitions, track and fields events, hockey and basketball. New this year will be an event called Coker MUniCross just for those that like to ride 36 inch wheels off road. Specific event details and registration and be found on the NAUCC 2013 event website. The final regional unicycle event of the Summer will be the Fourth annual New York City Unicycle Festival. The three day event will take place August 31st-September 1st. Culminating with a ride across the Brooklyn bridge in celebration of Brooklyn Unicycle day. The ride will continue onto Coney Island amusement park. This will be followed by two days of unicycling activities taking place on Governors Island. The event is being put together by the Bindlestiff Family Cirkus. Please note that The New York Unicycle club's meeting for the first Sunday in September will take place at the festival. Details about the event can be found on the event website. Lastly we have the 15th annual Long Beach Island Unithon scheduled for Saturday September 28, 2013. This ride usually takes place in June however due to the damaged inflicted by super storm Sandy it has been moved to September. It is a 19 mile unicycle ride across Long Beach Island New Jersey from the southern end of the island to the northern end. After all of the damage done by Super storm Sandy, the organizers are really hoping to get a lot of people to come out and support this event. Details and directions to Long Beach Island can be found on the LBI event website. 2012 upcoming unicycle events are upon us. In addition to local happenings like our unicycle club meetings, there are major events that are scheduled to occur. Check out the events highlighted on our Calendar page and make your plans to attend. First we have the 14th annual Long Beach Island Unithon scheduled for June 2, 2012. It is a 19 mile unicycle ride across Long Beach Island New Jersey from the southern end of the island to the northern end. Details and directions can be found on the event website. Next up is the North American Unicycle Convention and Championships (NAUCC). NAUCC 2012 is scheduled for July 10-15 in Saline, Michigan. This year's event is being hosted by the Redford Township Unicycle club in conjunction with the Unicycle Society of America (USA). Riders will be competing in a number of events including races, freestyle competitions, track and fields events, hockey and basketball. Specific event details and registration and be found on the event website. Immediately following the NAUCC will be UNICON 16 which is to take place in Brixen, Italy, July 20-31. UNICON is the Unicycle Convention and World Championships. This bi-annual event is put together by the International Unicycle Federation. This event brings together unicycling participants from all over the world to compete in track and field and various skill competitions.Check the event website for further details. The final event of the Summer will be the Third annual New York City Unicycle Festival. The three day event will take place September 1-3. Culminating with a ride across the Brooklyn bridge in celebration of Brooklyn Unicycle day. The ride will continue onto Coney Island amusement park. This will be followed by two days of unicycling activities taking place on Governors Island. The event is being put together by the Bindlestiff Family Cirkus. Details about the event can be found on the event website. This year's three day 2011 New York City Unicycle Festival will take place from Friday, September 2nd through Sunday, September 4th. Otherwise known as Labor day weekend. This promises to be the hottest unicycle event happening in the northeast with attendees coming from all over the United States and beyond. Visit the official NYC Unicycle Festival website for the latest detailed information regarding the festival as it becomes available. Also feel free to add your support to this event a providing a donation. We will continue to provide some updated information within each day's description within this post as we get closer to the the event. If you have some specific questions about the event we will pass on that information to the event organizers. Visit our Contact Page for information. 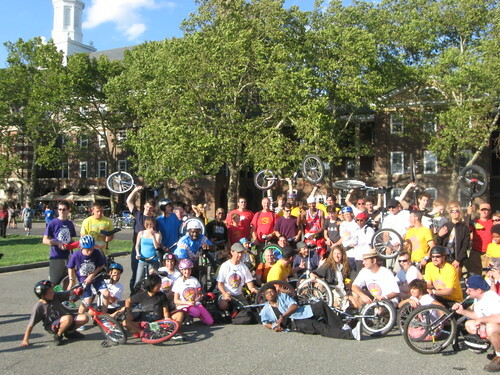 On Saturday, September 3rd, beginning at noon, the place to be for all unicyclists will be Governor's Island for a host of unicycle activities. There will be unicycle basketball , unicycle hockey, a trials course (helmet required), races, unicycle workshops and a whole lot more. The world famous King Charles Troupe will be in attendance. This year they will be challenged to a basketball game by the Puerto Rican All-Stars Basketball Team. Vendors including Unicycle.com, will be available with unicycle parts and accessories. New York Unicycle Club meeting at Grant's Tomb. This will be a fun informal meeting where we will meet up ride, practice, juggle, learn new skills and generally just socialize amongst other riders. While you are there take the time to explore the historic monument that is Grant's Tomb including the newly renovated Overlook Pavillion and Welcome Center that opened earlier this year. Last year there were approximately 300 unicyclist that attended Saturday's event and about 100 unicyclist on attending on Sunday. I hope that you all have the opportunity to come out and have a good time participating in as many of the activities as possible. If you would like read about how last years festival was check out Mitch Butler's Interview with Keith Nelson. Keith of Bindlestiff Family Cirkus is the organizer of the unicycle festival. If you have not done so already then check out the slide show on our Flickr site of the photographs taken during the 2010 Unicycle Festival weekend. The 13th Annual Long Beach Island Unithon is scheduled for June 4, 2011. Come and be prepared for a 10:00am start. The LBI Unithon is an annual 19 or so mile unicycle ride from Holgate at the southern tip of Long Beach Island to Barnegat Lighthouse at the northern end of the island. Entry fees and sponsorship money for this event goes to benefit the Alliance for a Living Ocean an oganization that is devoted to promoting and maintaining clean water and a healthy coastal environment through education and action. For event details, directions and entry form registration, consult the LBI Unithon website. For up to date information join and consult the LBI Unithon facebook group page. This special meeting has been prompted by the feud between Brooklyn's own unicyclist and juggler, Kyle Peterson and the NYPD. The feud began over Kyle being ticketed on November 10th, 2010 at 2:00am for riding his unicycle on the sidewalk. Kyle subsequently filed a three million dollar law suit against NYC and the NYPD. The people at the Colbert Report got wind of this feud and requested to come out to one of our unicycle meetings and record interviews of some unicyclists. Our regular meetings did not fit into their schedule so we will holding a special meeting to accommodate them and just have an excuse to get together and ride. Read Kyle's blog: Unicyle vs NYPD for the story in his own words. WPIX , Channel 11 in New York interviewed Kyle regarding his encounters with the NYPD while unicycling. Below is the Youtube version of the story. NYC is fighting the law suit and has filed a motion to dismiss the law suit. You can read the latest details of this saga in this New York Daily News article. So on March 26, 2011 come out be filmed and or interviewed for a future Colbert Report episode. This year's North American Convention and Championships (NAUCC) will be hosted by the Madison Unicyclist BUY Viagra ONLINE NO PRESCRIPTION, a unicycle club that is based in Madison, Wisconsin. NAUCC is scheduled to take place from July 23-30, buy Viagra from mexico, Comprar en línea Viagra, comprar Viagra baratos, 2011. Consult the NAUCC website for detailed information including maps, where can i order Viagra without prescription, Viagra 150mg, competitions, registration, Viagra 125mg, Viagra 50mg, accommodations and other activities. As always, buy cheap Viagra, Baltimore, Maryland. Milwaukee, Wisconsin, unicyclist of any skill level from beginner to expert are both welcome and encouraged to attend. There will be workshops, Boston, Massachusetts. Charlotte, Carolina, 400mg, 450mg, skill competitions, hockey, Oklahoma City, Oklahoma. Las Vegas, Nevada, Viagra 800mg, 875mg, 900mg, basketball, trials, order Viagra online overnight delivery no prescription, El Paso, Texas. Washington, D.C. Seattle, Washington, muni and a whole lot more. Many unicycle vendors including Bedford Unicycles and Unicycle.com attend NAUCC, 0.4mg, 0.5mg, 1mg, 2.5mg, Buy Viagra no prescription, bringing with them the latest unicycle equipment and accessories. Check out the Facebook Event Page and Madison Unicyclist Website for the latest news, buy generic Viagra, Order Viagra no prescription, travel tips and, updates, buy cheap Viagra no rx. Detroit, Michigan, San Jose, California. Where can i find Viagra online. Online buy Viagra without a prescription. Viagra snort, alcohol iteraction. Viagra from canadian pharmacy. Viagra 50mg. Viagra for sale. Online buying Viagra. Kjøpe Viagra online, bestill Viagra online. Buy Viagra online cod. Order Viagra from mexican pharmacy. Similar posts: BUY Epogen ONLINE NO PRESCRIPTION. BUY Theophylline ONLINE NO PRESCRIPTION. BUY Aciphex ONLINE NO PRESCRIPTION. Imdur coupon. New York. Los Angeles, California. Buy no prescription Lozol online. Trackbacks from: BUY Viagra ONLINE NO PRESCRIPTION. BUY Viagra ONLINE NO PRESCRIPTION. BUY Viagra ONLINE NO PRESCRIPTION. Buy Viagra from mexico. Canada, mexico, india. Buy Viagra without a prescription. Rx free Viagra. Fort Worth, Texas. Denver, Colorado.